great location, really close to the ferry, many restaurants and bars are around. I forgot to book my last night but the staff was really kind and it wasn't and issue at all! 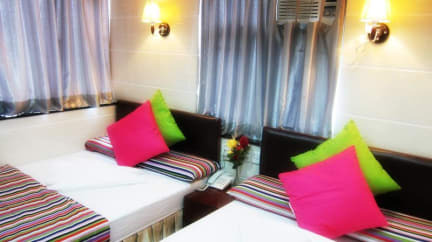 beds and towels get cleaned every day, overall a cheap and good stay in a great city! Stayed for 7 days. The room itself was very small but this is normal for HK. room had a safe and private bathroom with space under bed for bags etc. 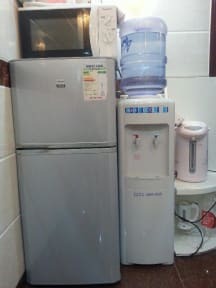 We had access to a fridge, water cooler, kettle etc. accommodation is situated on the 16th floor With one lift so we always used the stairs. (Not ashokas fault) Staff very friendly and willing to help with any problems (didn’t have any). We would definitely go back based on price and staff. If the lift situation is resolved this would be a bonus. Great location and value for money. Only downfalls were the size of the rooms, felt A little unsafe downstairs, there was sometimes/often a 5-10 minuet queue for the lift and the people trying to sell you stuff on the ground floor. Chunking Mansion is a must in HongKong if you travel as backpacker. Unfortunately the overall quality of all hostels in mansion is not good I would say. The rooms and beds are very small. Bathroom is tiny and I get only cold water for shower. Cleanliness was good, but seems that somebody is cleaning the room every day and basically going through your stuff. There is no place to store your valuables, be careful. Staff was very unhelpful with mistake in reservation (obviously hostel fault). Typical with HK, place is quite small. Only 1 TINY bathroom for ALL the dorms. Bathroom doesn't even have a separate shower. Once you are in your room security isn't bad, but the building (Chung King Mansions) has security issues. Many Indian guys out front selling everything, they are quite pushy. Staff was very nice. Place was clean. Cheap price. Absolutely no atmosphere. Only common area is reception. Handfull of chairs & small table. Would not recommend this place. If you don't expect much and just need a place to sleep it's okay. Dirty sheets so bring your own sleeping bag. Room extremely small. Saw a bug in room. No hot water for shower. Tiny bathroom. Needs more cleaning. Long line for elevator. People standing around downstairs are sketchy. 20min elevator to go upstairs in the hostel. no lounge area. tiny dorms. 1 bathroom for the entire floor. 3 lockers in a 4 bed dorm. all that for only £50 a night! what a bargain!